Lima Village Hall is located at 7329 East Main Street, Lima, NY 14485; phone: 585-624-2210. Photo: Bristol House, ca. 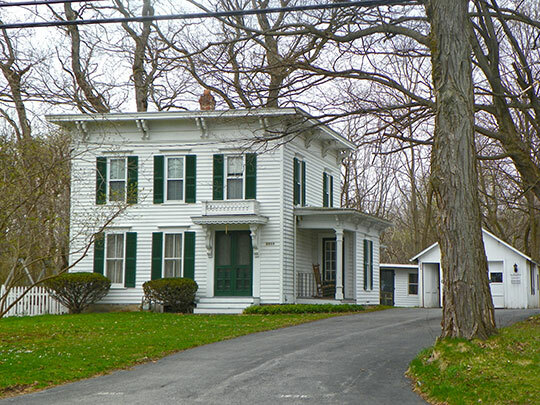 1875, 1950 Lake Avenue, Lima, NY. Listed on the National Register of Historic Places in 1989. Photographed by User:Lvklock (own work), 2013, [cc-by-3.0 (creativecommons.org/licenses/by/3.0)], via Wikimedia Commons, accessed November, 2013. Organized in 1797 as the Village of Charleston, the name was changed in 1808 to Lima. In his 1881 description of Lima, New York, Livingston County historian James H. Smith identified nearly every historical circumstance that had to that date shaped the course of events in the village. The shortest route between Albany and Buffalo has always passed through Lima (present-day Routes 5 and 20; originally known as the State Road and later known as the Genesee & Ontario Turnpike); this major transportation route has clearly affected the degree and nature of the community's commerce, as well as the quality of its built environment. That so much of its nineteenth- and early-twentieth century architecture exists today stems largely from the lengthy presence of Genesee Wesleyan Seminary and from the virtual absence of rail transportation through the village proper. Nancy L. Todd, National Register Program Assistant, New York OPRHP, Division for Historic Preservation, Lima Town Multiple Resource Area, Livingston County, NY, nomination document, 1989, National Park Service, National Register of Historic Places, Washington, D.C.
James H. Smith, History of Livingston County, N,Y (Syracuse, NY: D. Mason and Co., 1881), 472.